We caught the bus up north to the Handicraft Center and killed some time there. I had been there before, but not the museum part. I had only visited the gift shop for some reason. Let me tell you, this gallery was amazing! They had real live examples of Kyoto (and Japanese) crafts and trades. They even had some legitimate craftspeople working on display so you could see how they were working. Needless to say, we killed a bunch of time in there. After that, it was time to get on the bus again, heading even farther up north to meet Ms. Emi of Uzuki Cooking in front of the Kyoto University of Art and Design. She met us there and walked us to her house nearby. In order to set up our cooking class, I had emailed her a little under a month in advance to see if she had any openings. I told her my dietary restrictions and she was very accommodating! Easy as pie. Our cooking class was so fun! Ms. Emi was so cheerful, bubbly, and encouraging! 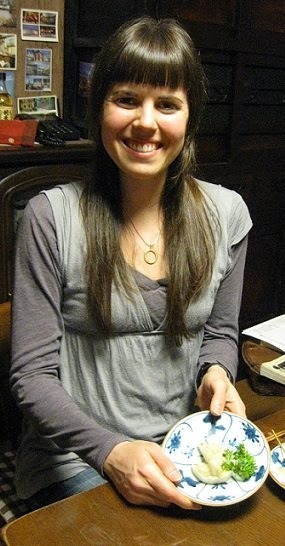 I know I had a wonderful time experiencing traditional vegetarian Kyoto-style cooking with her in her kitchen. 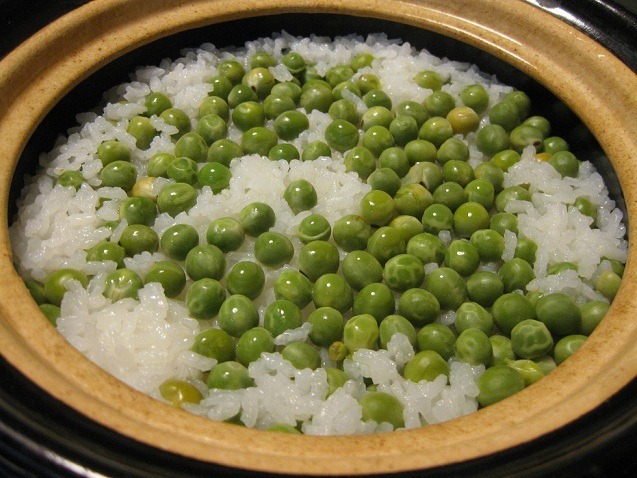 We made rice with fresh green peas in a clay pot, no electric rice cooker. 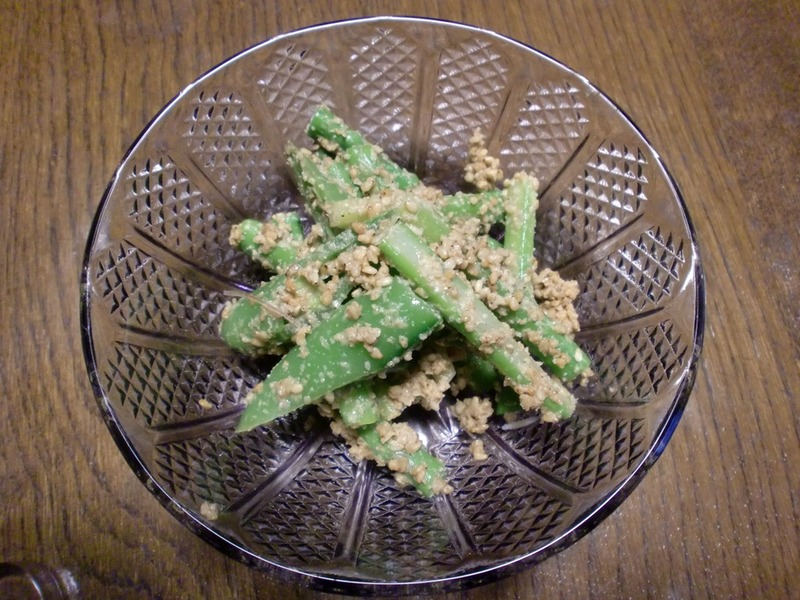 It was my first time to cook with actual fresh green peas… I had always eaten them frozen before this! But they are amazing fresh. 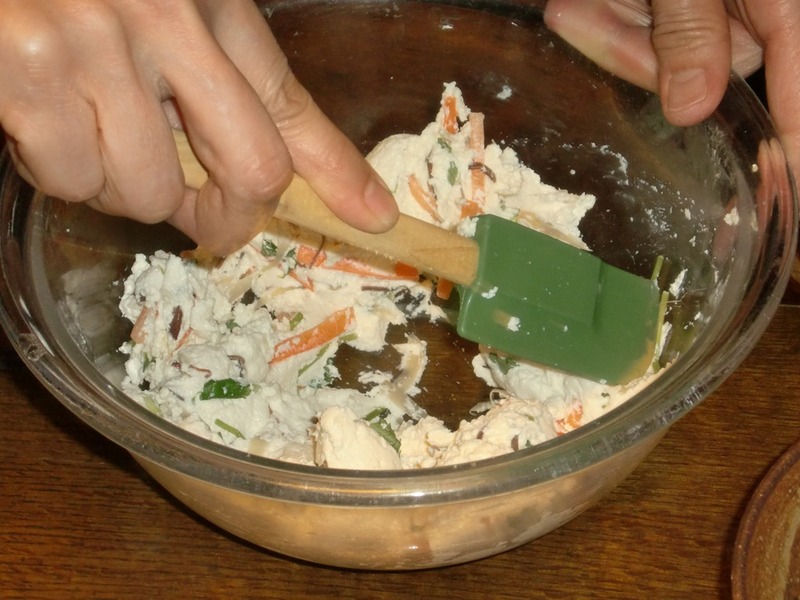 Then we started on a lightly-cooked seasonal vegetable salad with white sesame dressing (goma-ae). It is usually made with spinach, but we used asparagus and snap peas. We only boiled the veggies for a few moments, so they were still a bit crunchy. We ground up the sesame seeds and mixed in some soy sauce and mirin and a tiny bit of natural sugar… Then mixed it all together. After that we started on the deep-fried tofu balls! I know many of you are not lovers of tofu like me, but these were awesome. I had never made anything like that before. They were made out of okara, which is a by-product of soymilk production. When you cook the beans and squeeze out all the liquid, okara is what you get after. It’s pretty much high-fiber, high-protein, low-fat soy pulp. Mmmm yummy! 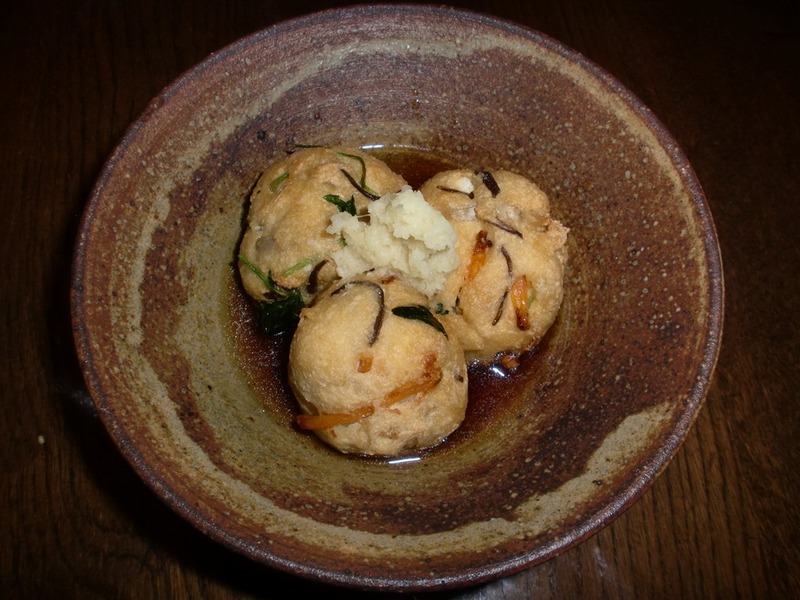 So you combine that with some grated naga-imo potato + veggies, roll them into balls, and pop them in a pot with some oil. We enjoyed these with a simmered sauce. Next, we started on a simmered dish. We soaked the koya-dofu (freeze-dried tofu) in water so it would become soft and spongey again, and then I squeezed all of the water out. We simmered it separately from the fresh yuba (soymilk skin, another by-product of soymilk making), but then combined them later. We added shiitake mushrooms and a few greens. I think it was my favorite dish that we made. 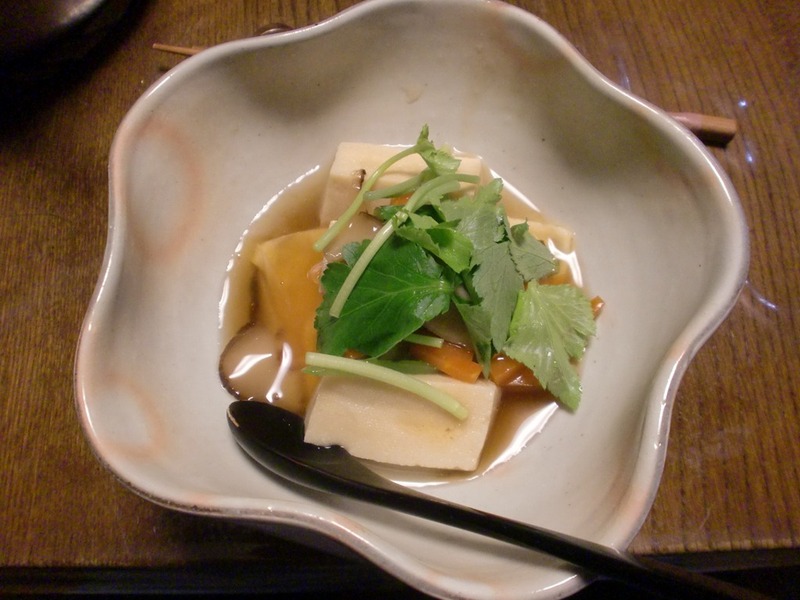 Lastly, we made dengaku-style daikon/nama-fu. Nama-fu is basically wheat gluten mixed with some mochi rice flour and millet, so we made that for Aunt Jan/Ms. Emi and the daikon version for me. 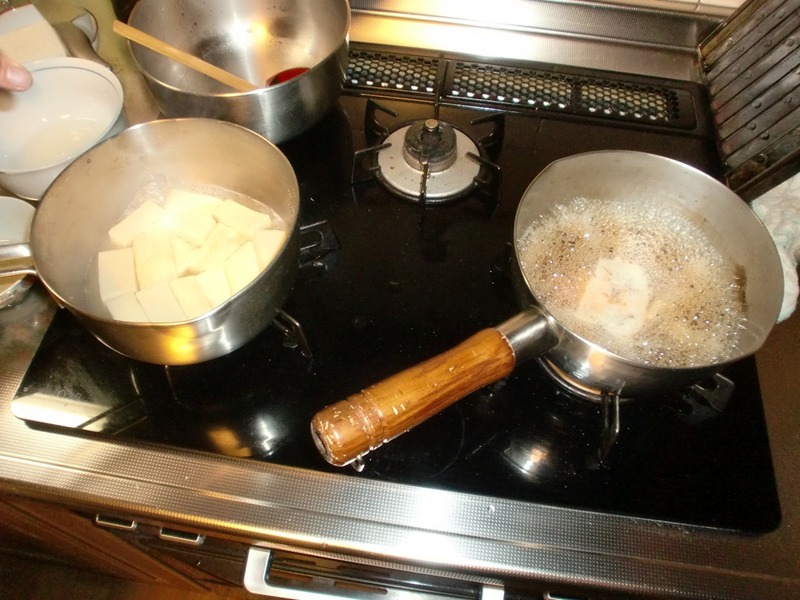 We pan-fried the sliced daikon radish and nama-fu until done. 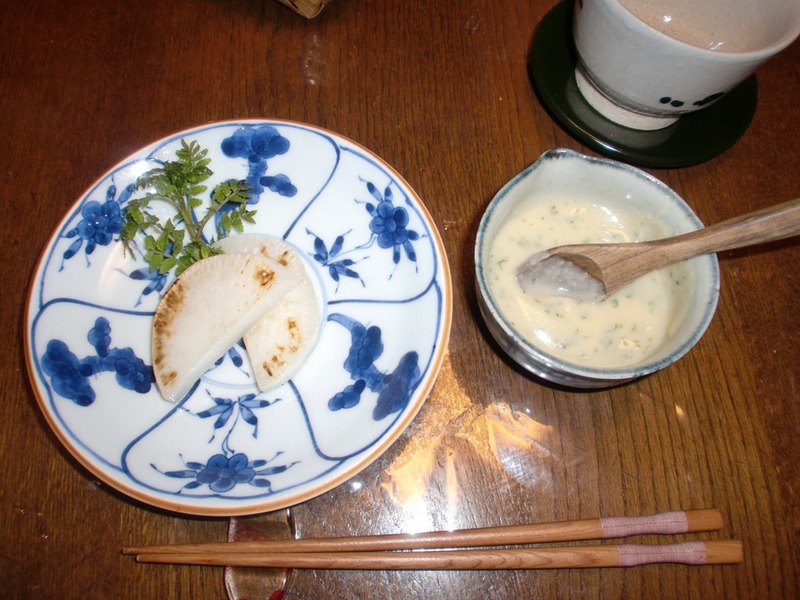 We coated it in an amazingly delicate white miso sauce. The three of us finished up the dishes and I got to eat whatever Aunt Jan didn’t want to finish. :3 We sat around and talked for a bit. Ms. Emi offered us some of her home-made ume-shu (plum wine). How could we resist? It was the most delicious ume-shu I had ever tasted. Once finished, we gathered our things and got ready to head back out into the rain. We said farewell and thanked her profusely for the great time. Then we were on our way. It was only raining a little bit by that time, but enough to be annoying. We stopped at a Lawson 100 before catching the bus back to Kyoto station. I had hoped to be able to stop by the Isetan food floor to pick up some more snacks for the train ride, but… unfortunately we arrived there at 8pm, right as they were closing. Darn! That was most unlucky. So we decided to call it a day and went to the bus terminal area to try and figure out where the stop was to the bus that would get us back to Yahata. We floundered a bit in this (hey, we were tired) but eventually found the right bus. 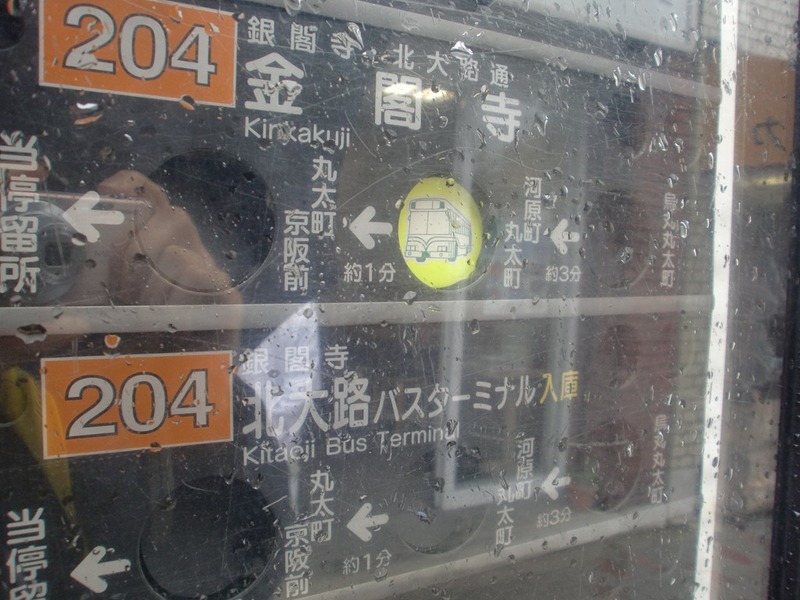 That was the last use of our bus pass, which saved us a grand total of 380 yen that day. I was reluctant to leave the city center, but I was also tired and needed to pack up my suitcase. I loved this trip. To tell you the truth, I probably would not have traveled anywhere if Aunt Jan had not come to Japan. I probably would have just stayed in Hirosaki and gone to work. How boring!! Thanks to her, I had another amazing adventure in Japan. Like I said, we had both been to Kyoto before… Twice! But never together. Places are always different when you have different people to explore them with. You see things differently, discover new places, and experience through a different lens. Oh, and Kyoto remains one of my favorite places in Japan. Well, I didn’t know about the cooking class! Now I am extremely jealous and so wish I could have an experience like you had with Aunt Jan with my own daughter! Amazing and so well planned your trip to Kyoto was! 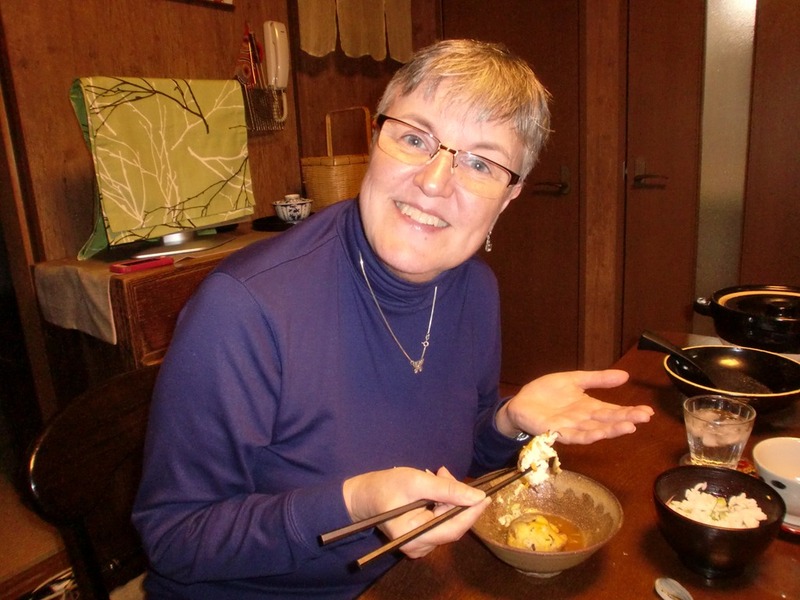 You are so fortunate Aunt Jan made the trip so you could add yet another great experience to your Japan life!